Beekeepers can get practical information on harvesting and extracting honey with a new publication, produced by NSW Department of Primary Industries (DPI) Tocal College, launched at the NSW Apiarists’ Association Conference. DPI Technical Specialist Honey Bees and co-author Dr Doug Somerville said the guide, Honey Harvesting and Extracting, informs beekeepers of the best management practices to harvest and extract honey to ensure they get the highest quality product. “This practical guide will assist beekeepers whether they are small-scale recreational or commercial operators,” Dr Somerville said. “Important information on the best way to handle honey, including food quality, food safety and compliance with legislation are covered in the guide. “Beekeepers are advised of the best way to remove honey from the hive so that it retains its natural goodness and the highest quality product is produced. Dr Somerville said the guide outlines the best practice for transporting honey from the hive to the extracting facility, and includes the key principles for the design, construction and cleanliness of the premises. “There is also a section on mobile extracting plants, as many of the requirements for central extracting plants also apply to mobile plants,” Dr Somerville said. “Beekeepers are reminded that all food products and ingredients should be stored under adequate facilities and conditions to ensure product safety and to minimise the potential for contamination or microbial growth. Tocal College offers a range of short courses in beekeeping skills as well as the Certificate III in Beekeeping. 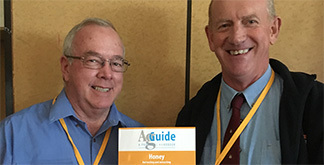 The Honey Harvesting and Extracting AgGuide is available in hard copy, online or mail order from Tocal College or as an ebook through iTunes and Google Play.